Here's an interesting product. If you look at the ingredients that are used, and indeed if you open a tin and smell the contents it actually smells appetizing! However, be aware that it is also quite expensive, particularly if you opt for the can version! The food is aiming for the same market as Orijen, taking the assumption that a dog's diestive system has evolved little from that of the wolf (which some veterinarians would disagree with, arguing that over many generations a dog's digestion has indeed evolved to cope with a human diet, albeit table scraps - which is what they were fed for a long time before dry dog foods turned up). "Dog are natural carnivores and they need meat to thrive and to be healthy. Dogs intestines are shorter than that of cows, horses and people, which is adapted to absorb protein contained in meat far better than found in cereals such as wheat, maize and barley. 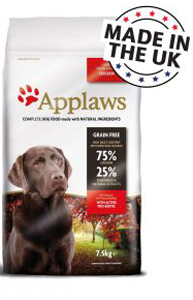 Applaws also contains an active Pro-biotic which may encourage protective and friendly bacteria in the gut to support a healthy digestive system in both puppies and adult dogs. 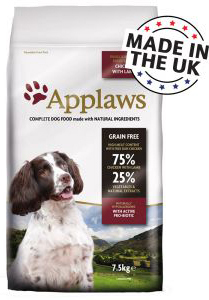 As well as being naturally hypo-allergenic, it contains purified beta glucan from yeast to help improve the immune system." As indicated these are expensive foods, and prices are around the same, if a little less, than Orijen once you even out the different bag sizes on the dry food. But they are free of the poor quality ingredients found in many foods, so they are never going to be cheap! Expect to pay c £30 for a 7.5kg bag. 66% chicken (from dried chicken meat), 8% chicken mince, 6% potato starch, 8% dried peas, 2.5% poultry oil (omega-6 fatty acids), beet pulp, poultry sauce, whole egg (from dried eggs), cellulose plant fibre, minerals, vitamins, salmon oil (omega-3 fatty acids, EPA & DHA), dried tomatoes, dried carrots, chicory extract, alfalfa meal, seaweed, yeast extract (purified beta-gluten min. 0.1%), glucosamine, dimethyl sulphate, chondroitin, carrot, peppermint, paprika powder, turmeric, thyme extract, citrus extract, taurine (1000 mg/kg), yucca extract, lingonberries, fennel extract, carob extract, ginger, rose hip extract, dandelion extract, rosemary extract, oregano. Additives: Vitamin A [retinyl acetate] (19,000 IU/kg), vitamin D3 [cholecalciferol] (2000 IU/kg), vitamin E [alpha-tocopherol-acetate] (640 mg/kg), sodium selenite (0.33 mg/kg), calcium iodate, water-free (3.26 mg/kg), iron sulphate, monohydrate (233 mg/kg), copper sulphate, pentahydrate (40 mg/kg), manganese sulphate, monohydrate (94 mg/kg), zinc sulphate, monohydrate (444 mg/kg). Natural antioxidants: mixed tocopherols. To stabilise intestinal flora: E1705 Enterococcus Faecium cernelle 68 [SF68; NCIMB 10415] (1,000,000 KbE/kg).